In AbtracOnLine you can search and quickly access a range of project related data from Clients, Contacts & Projects > Search. The Search screen allows you to preview a wide selection of Clients, Contacts and Projects data. It’s also a handy place to browse information before drilling down to specific client details. ‘Off the shelf” the Search screen displays the following fields : Client/Contact Names, Project Description, Project Owner, Project Creation Dates, Project Codes, Project Type, Project Status, and Project Comments. Here you can also add Contact Owner, Person, Phone, Email, and Address details to your default view. You can also change the position and widths of your chosen fields within the search table. For each of these search categories you can either enter a name (or partial name) to search for. You can enter search options in more than one column to further refine your results. Results will display automatically after typing or filtering with the search boxes. Clicking on the Contact Name or Project Code will take you directly to that record. Typing “street” in the project description will bring up all projects that include that word . For a more inclusive search you can enter a partial word, eg. typing “st” will include more results. Searching in more than one field refines your results. e.g typing the client name and project description eliminates results from other clients. You can clear the current search with the ‘x’ at the left of the search bar. You can also filter search results in the project status and type columns. Choose how results are sorted by clicking on the relevant header, a black arrow will then display to indicate the current sort order. The default search setting will show current clients and projects only, you can amend this by selecting the search criteria option at the top of the search screen. 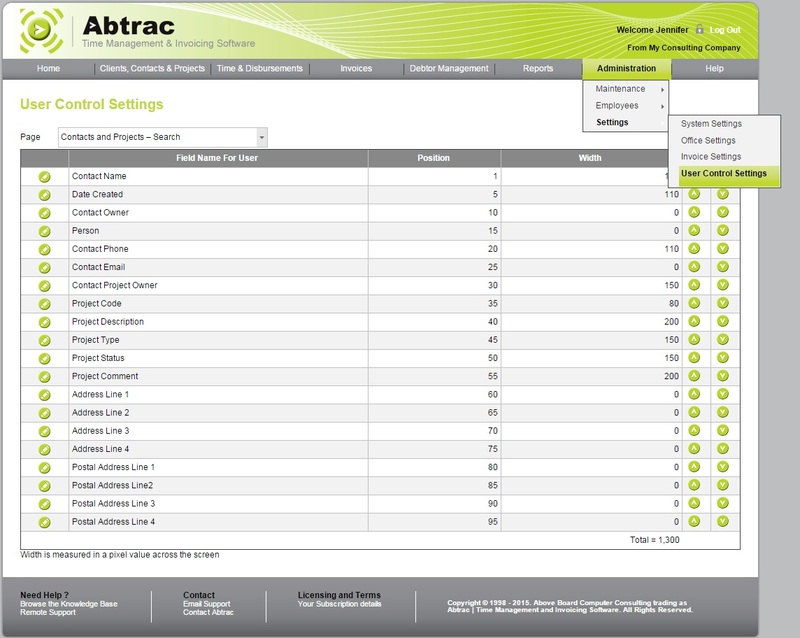 This entry was posted in Clients & Contacts, Getting Started and tagged AbtracOnLine, browse, data entry tables, filter, find, search, user control settings by Jen. Bookmark the permalink.